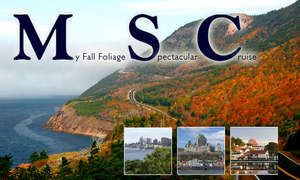 FORT LAUDERDALE, FL--(Marketwire - April 14, 2010) - Single travelers can experience the fall foliage of Canada/New England cruises on MSC Poesia for new, reduced rates. Guests who book an interior, oceanview, or balcony stateroom for one on MSC Cruises' 2010 Canada/New England cruises by August 31, 2010 can save with these new rates. -- 14-night"Autumn Leaves and Lighthouses," cruise from Quebec City and calling in Sydney, Nova Scotia; Bar Harbor, Maine; Boston, Massachusetts; Newport, Rhode Island; New York, New York; Halifax, Nova Scotia; and Charlottetown, Prince Edward Island. October 9; single rate was $2,428.20 and is now $1,618.80 per person (plus $129.45 pp. GFT's) for a savings of $809.40. Rates are available for residents of the US and Canada; offer is per person, cruise only and subject to availability. MSC Cruises has the most modern fleet in the world with eleven ships: MSC Magnifica, MSC Splendida and MSC Fantasia, MSC Poesia, MSC Orchestra, MSC Musica, MSC Sinfonia, MSC Armonia, MSC Opera, MSC Lirica and MSC Melody.